Why did you operate the grinder without the guard and hand rest? Why did you get off the forklift before it completely stopped? I know how the truck handles and how far it goes back. Why didn’t you lock out the machine before working it? I thought I was the only person in the area and the machine was off. Why did you start backing up your haul truck on the dump without a spotter? Fortunately, each of them could answer the questions. Others who have done some of the same things can’t. If you have been in safety any length of time you have likely heard these types of answers too. The people involved in these incidents are not bad people. Yes, they did participate in behavior that seems pretty silly, but they’re not the only people to ever do these kinds of things. At the heart of the matter is this: to develop a great safe work culture, you really need to challenge attitudes, behavior, and the ways of thinking that run deeply in people. 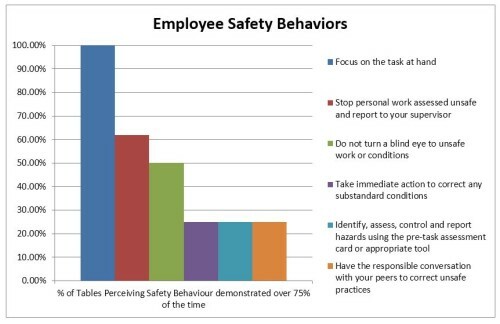 During safety culture workshops we always ask questions about what types of behaviors they know are occurring in their workplaces that shouldn’t be. If we ask individuals how often they participate in this behavior, the answer is almost always ‘never’. However, when we ask how frequently other people are involved in such behavior, the answer is much more often to the point: it happens frequently with other people, but not with me. We’ve found that most people respond to questions about how they would intend to behave if the situation were typical, but if they actually find themselves in a particular situation; their actual behavior may not be quite at the level of what they know to be acceptable behavior. There also seems to be a big difference between what people say is the way they would behave in a situation compared to how often they believe other people actually practice the right behavior in the same situations. When assessing an organization’s safety culture, it’s often more meaningful to determine how regularly something occurs, either by directly observing the workplace or finding out how much employees see their coworkers acting unsafely. If they believe others are doing things they shouldn’t, that is the perception of your safety culture. I would have got the hot work permit, but it was only a small piece to cut off, it was the end of shift, and it needed to be done before the next shift. I wouldn’t normally make a call on our cell phone in the car but I knew he wouldn’t be available later and I had to get approval right away. We are not sure if you view these types of explanations as justification for people’s behavior, but anyone else watching could only assume safe behavior isn’t important. Our brain is very powerful justifying our actions because we need to ensure we preserve our self-esteem and think of ourselves as good people. But if people are asked if they have seen this behavior in other people, they very quickly agree it happens if it exists in your work culture. Remember, the people were asked to think about how often they see these behaviors occurring in their coworkers at least 75% of the time. You would likely think this organization has poor safety performance, but their safety performance is considered to be in the middle for other companies in their industry. Asking the question from another person’s point of view could provide a much more meaningful understanding of what needs to be worked on within for your safety culture. Remarkably, very few tables were willing to say they see other people taking immediate action to correct substandard conditions or using the safety tools they should, or willingly having tougher conversations with their peers 75% (or more) of the time. Interestingly, the notion of being ‘good people doing the right thing’ enters in when all tables reported they see people focusing on the task at hand, but the number of tables drops quickly when they think about how often they see other people not stopping unsafe work and reporting it to their supervisor. This is quite useful information for the company and allows them to really focus on aspects of their safety program to improve it. Safe behavior can’t just be about good intentions. When things become too normal, predictable, or aren’t challenging, people may not consistently exercise the right behavior. But most likely, other people and the organization knew some of these things were occurring. Assessing the behaviors that do or do not occur consistently in your culture, creating programs that help people see the issues personally, and then speaking and acting passionately to change the behavior will help create the safest work culture. Presents with energy, clarity, excellent examples.